Is it too early to start talking about Thanksgiving? Even though I’m really not making anything for this years feast, I love hearing about what’s on everyone else’s menu. Hi, have we met? I could talk about food all day long. If I was hosting the feast, I’d probably be making some version of this. It know it can be hard being a vegetarian at Thanksgiving, which is probably why my family bends over backwards to make sure I’m not hosting it. I know that it’s a holiday most often centered around eating a turkey and for traditionalist, not having that at the table feels like blasphemy. Well, not in my house. 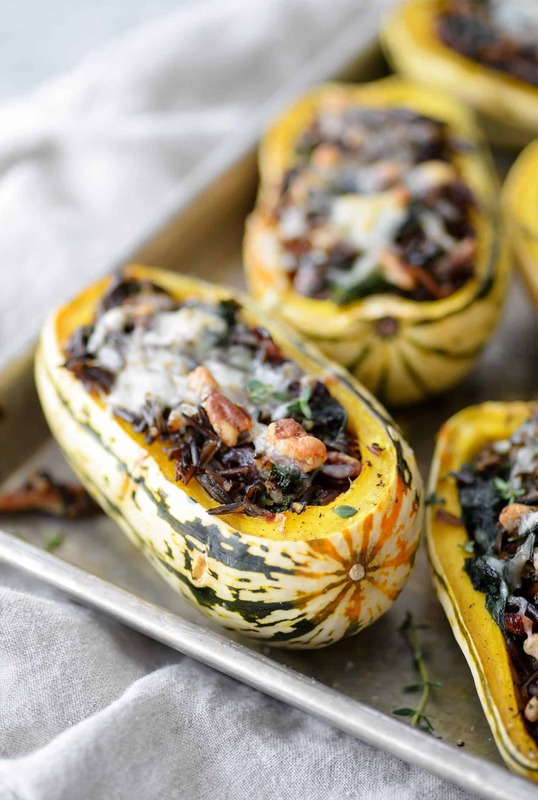 If you’re looking for a wow main dish for vegetarians or a side dish for the rest, I suggest these wild rice stuffed squashes. They are hearty and filling enough to be a main, and delicious covered in mushroom gravy. I know. 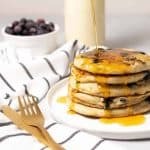 I ate these for almost a week straight as I tested out different combinations and they are just as good the first time as they are as leftovers. I’m a big fan of stuffing most things on Thanksgiving. Perhaps it’s a nod to the turkey that we won’t be having. We can stuff other things! Acorn squash, pasta shells, peppers, oh my! 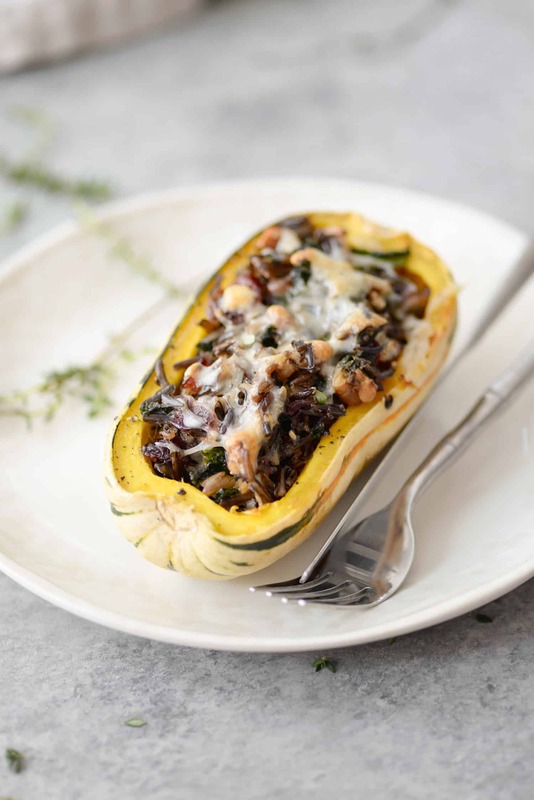 I choose delicata squash here because they are almost effortless to make. Since we’ve got so many other things to focus on for Thanksgiving, peeling squash shouldn’t be one of them. 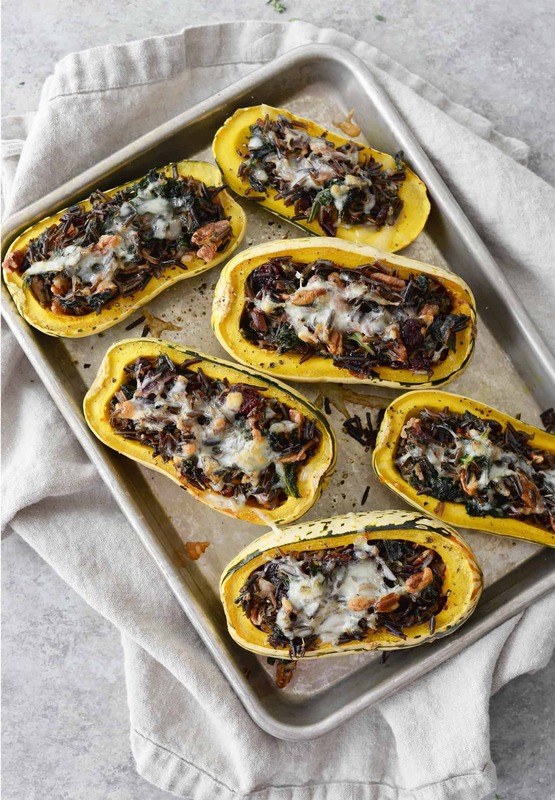 Delicata squash has such a tender skin that you can eat it whole after roasting. To ensure that they are soft enough, I roasted the squash first, then stuffed. The stuffing is basically cooked anyways, you are essentially just warming it up in the oven and melting the cheese. I tried baking the stuffing in the squash without roasting the squash first and it turned out to be a hard mess. So don’t do it. The stuffing becomes too dry this way and it’s not worth the effort. Roast the squash until tender, then stuff, then bake again. This entire meal reminds me of a fall feast. 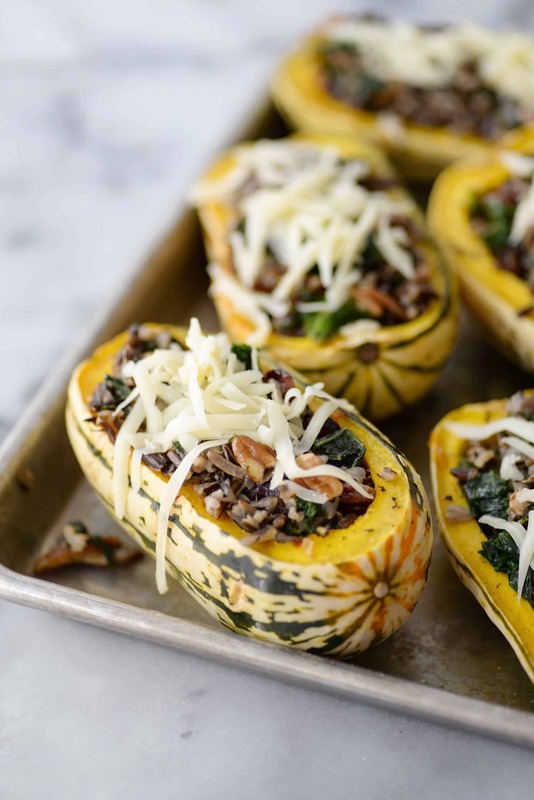 Tart cranberries, hearty kale and toothy wild rice stuffed into a squash and covered with cheese. 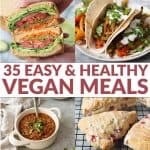 I know that using the cheddar takes this out of the vegan category, but I think it’s necessary. I tried these without the cheese and I just feel like they didn’t have the ‘oomph’ that I wanted. My vegan friends, I suggest using a dairy-free cheese or perhaps a cheese sauce after roasting. Lastly, another suggestion. I tested this one as a salad and it worked out perfectly. I almost debated sharing that recipe instead, but decided that a stuffed version would serve more of you. For the salad version, slice the squash and roast as half moons. 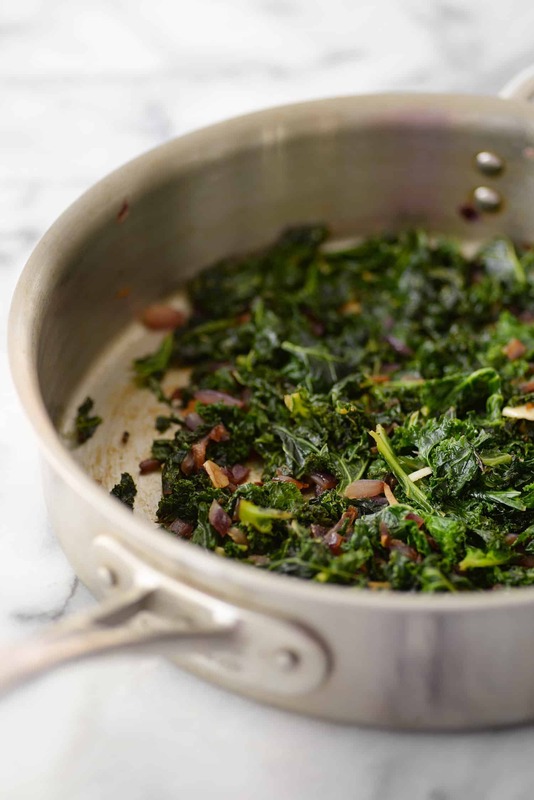 Make the rice, make the kale and toss together. Add the roasted squash and small cubes of cheese (it’s optional here.) Enjoy warm or at room temperature. Preheat oven to 400 degrees F. Halve the delicata squash and remove the seeds. Rub the squash with olive oil and season with salt and freshly ground pepper. Place on a baking sheet and set aside. Bring the water to a boil and add the wild rice. Cover and cook over low heat for 40-45 minutes or until the rice is fluffy. While the rice is cooking, place the squash in the oven and roast for 20 minutes or until the squash is cooked through and tender. Set aside. While the rice and squash is cooking, prep the kale. Heat a large skillet over medium heat and add in the remaining olive oil. Add the onion along with a large pinch of salt and pepper and cook until soft, about 5 minutes. Add in the garlic and kale and cook until kale is tender. Stir in the thyme, vegetable broth, pecans and cranberries and cook another 1-2 minutes. Remove from heat and add in the cooked wild rice and cheese. Season to taste with more salt and pepper, if needed. Stuff the squash with the rice mixture and sprinkle with more cheese. Place back in the oven for 5-10 minutes until heated through and cheese is melted. Serve! You will likely have more filling than needed, that’s on purpose! I’d rather you have more filling than not enough depending on the size of your squash. 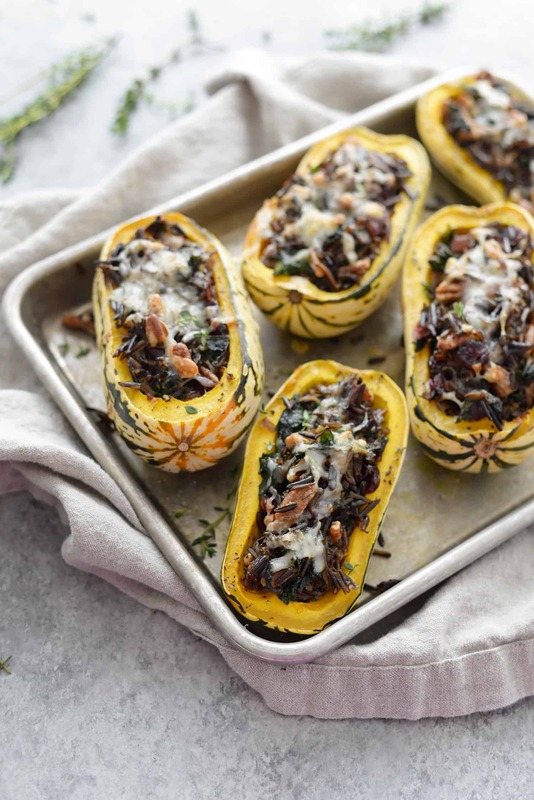 The beauty of delicata squash is that you don’t need to peel them before cooking, they are tender enough to eat the skin whole. When you first remove them from the oven, make sure the squash is tender as it won’t cook much more the second time around.